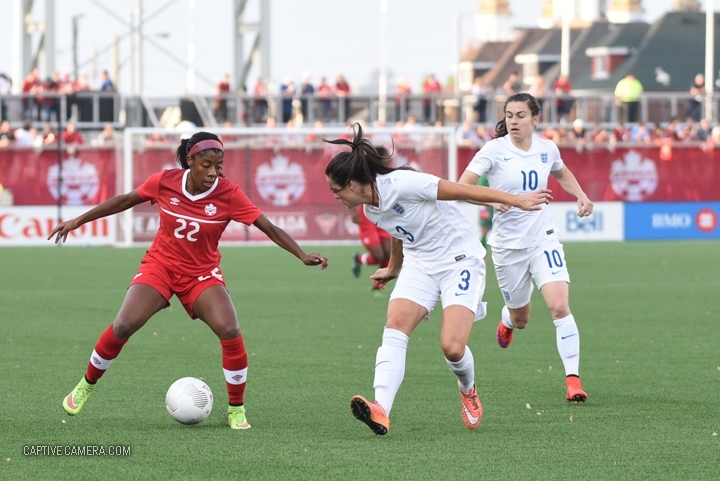 Canada hosted Dominica in the second leg of the home-and-away series on June 16 at Toronto's BMO field. 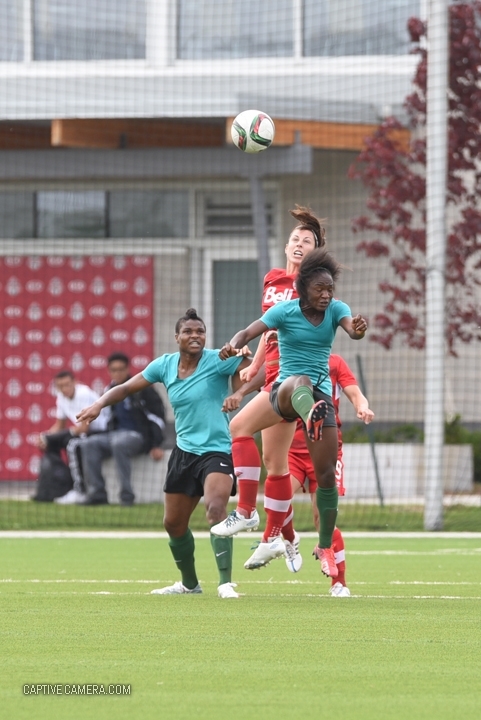 In their previous encounter on June 11 in Dominica, Canada took control of the series with a 2-0 victory. 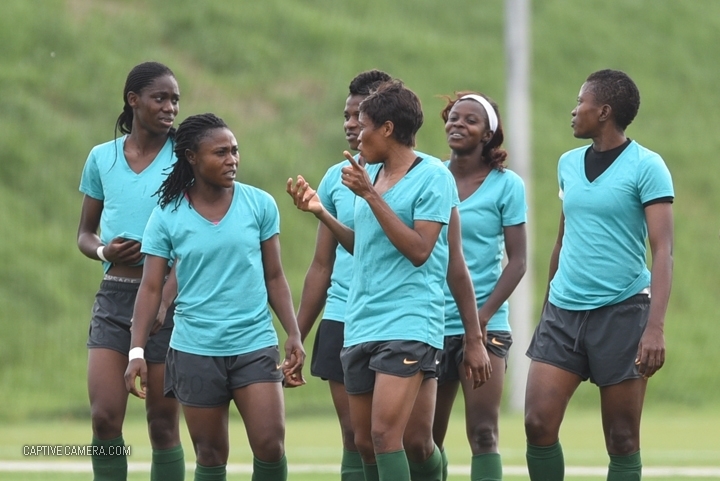 Now back on home soil, it did not take Canada long to extend their advantage as the first goal from Tesho Akendele came in the 4th minute. 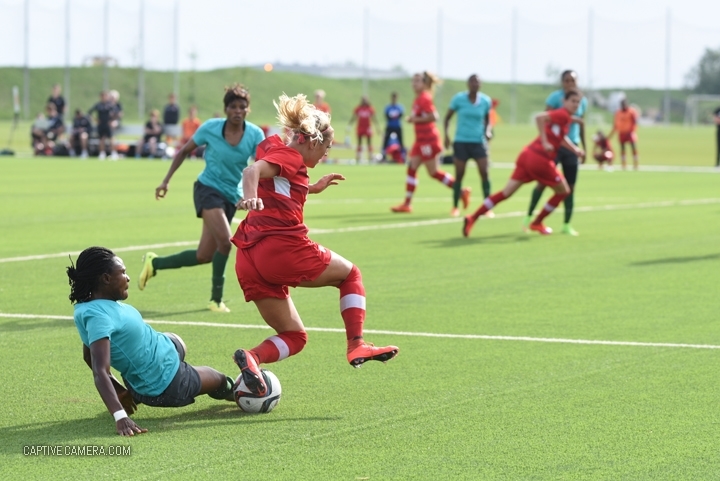 Despite their quickness, Dominica had difficulty maintaining control of the ball against a better composed Canadian side. 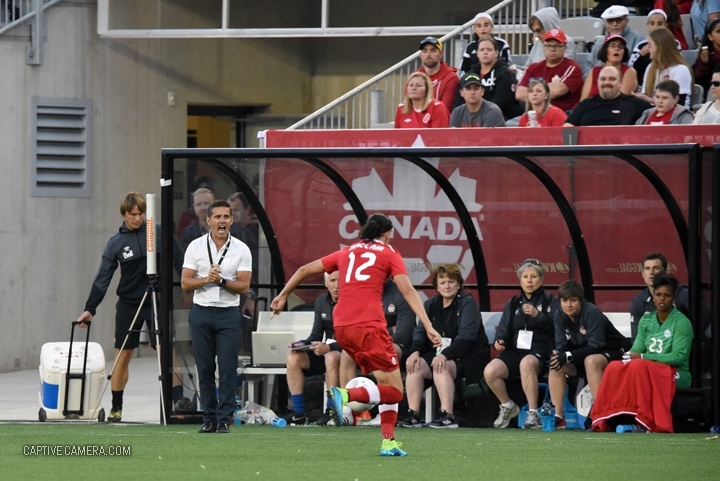 Cy...le Larin scored his 3rd goal in 3 consecutive games in the 41st minute to double Canada's lead. 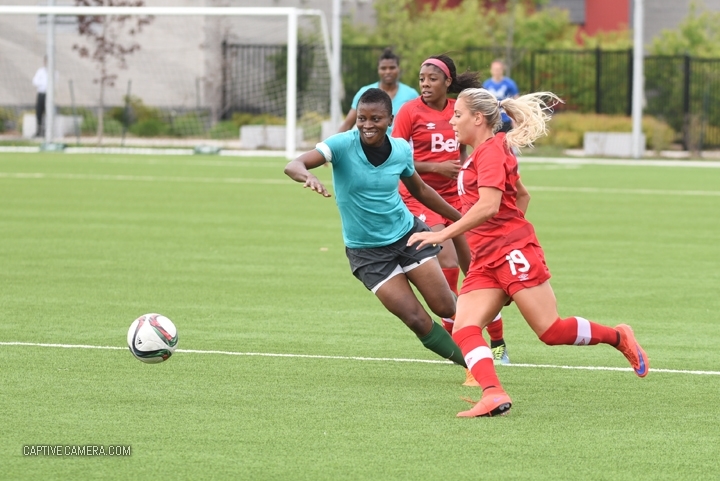 The second half saw Canada continue to dominate the game and was rewarded with two more goals, both scored by Tosaint Ricketts to increase his international goal count to 10. 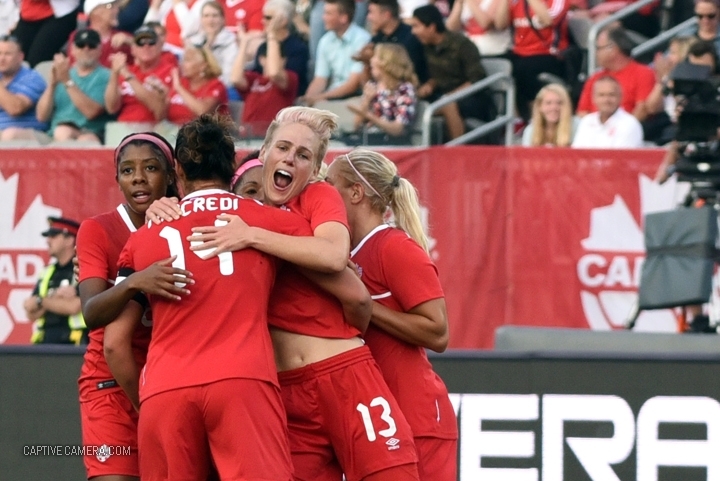 With the 4-0 victory and 6-0 aggregate score, Canada advances to the third round of the CONCACAF regional qualifiers for the 2018 FIFA World Cup. The third round, another home and away series will be played later this summer between August 31 and September 8. 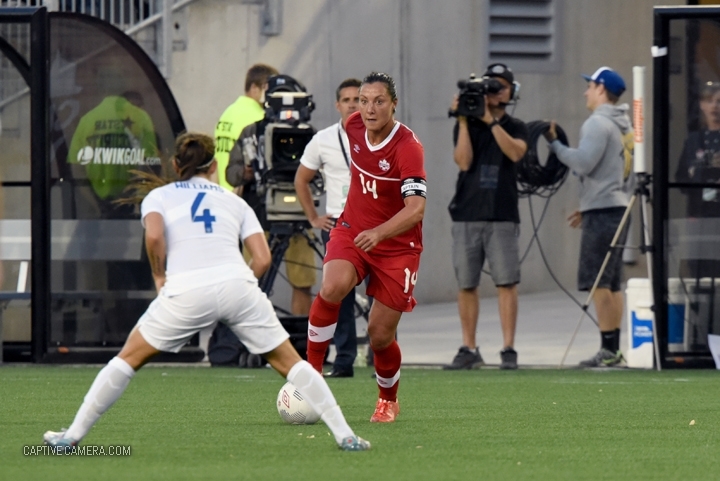 The official draw on July 25 will determine Canada's next opponent. 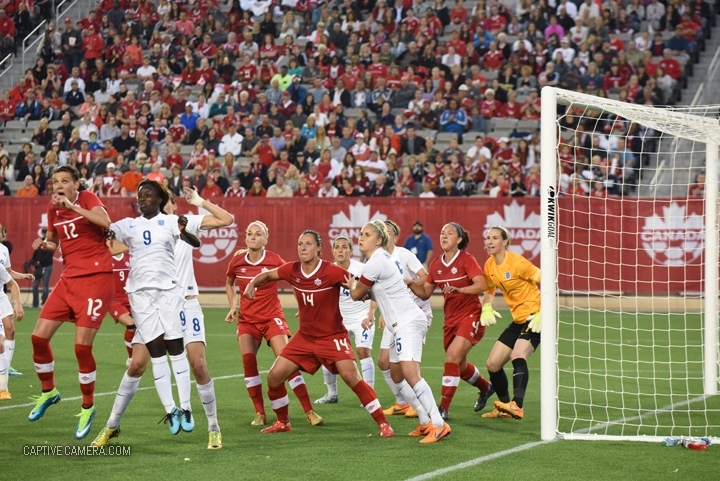 The Canadian women's national team faced off against England in an exhibition match in front of 23,000 fans at Tim Horton's field in Hamilton, Ontario. 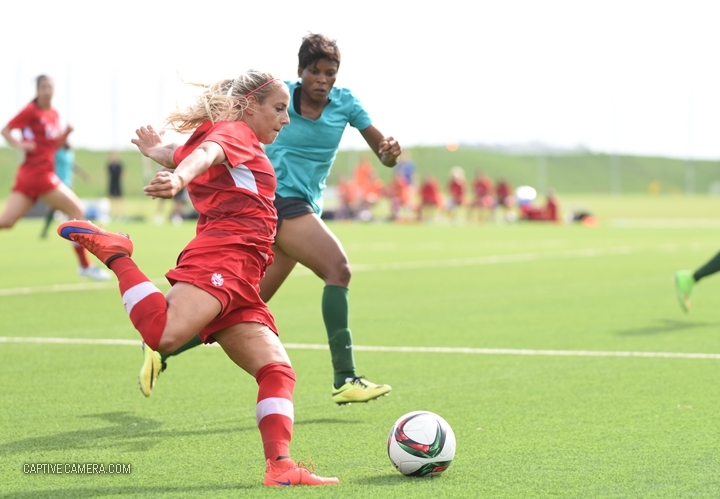 This marked Canada's last exhibition match before the 2015 FIFA Women's World Cup Canada kicks off on June 6. 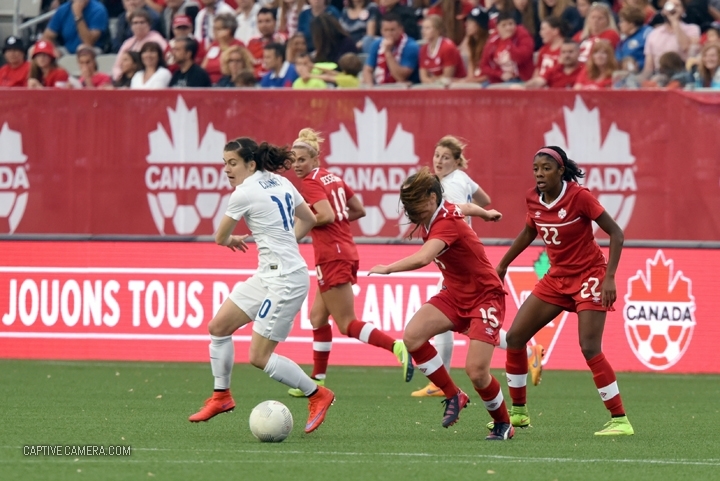 England, ranked 6th in the world has topped Canada in their last 3 encounters, most notably in the 2015 Cyprus Cup final where England won by a 1-0 score line. 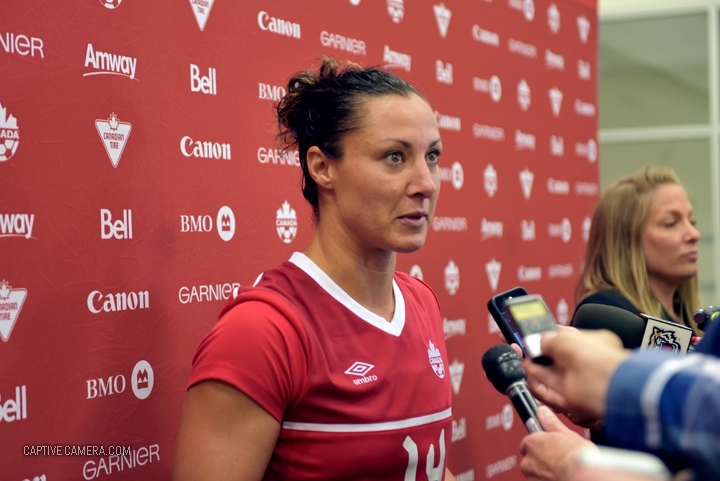 In addition to retribution, Canada was seeking to start their World Cup campaign on a high note. 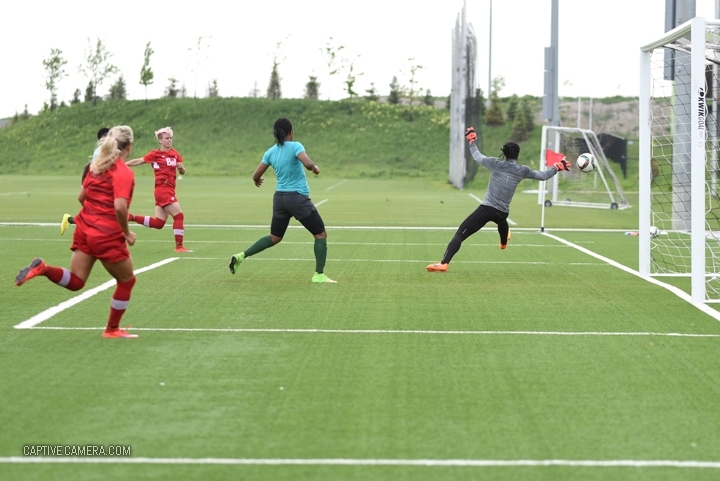 Although Canada set the tone for a fast paced and aggressive game, England had the initial opportunities on goal but Canadian netminder Erin McLeod was quick to make the timely saves. 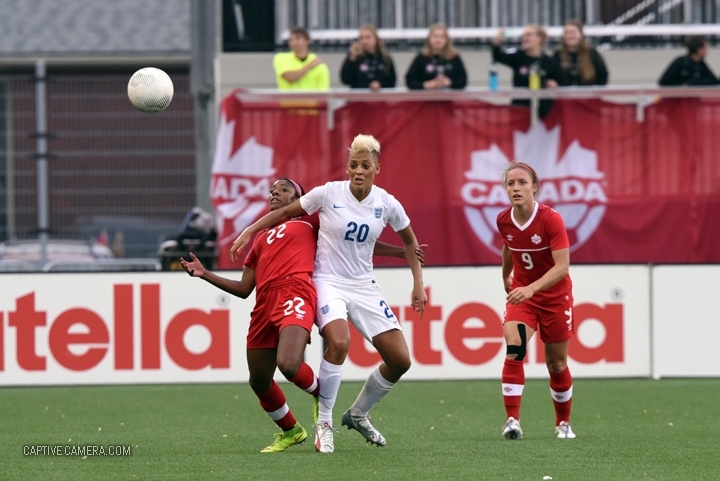 Canada continued to battle for 50-50 balls to overwhelm and suffocate the English midfield. 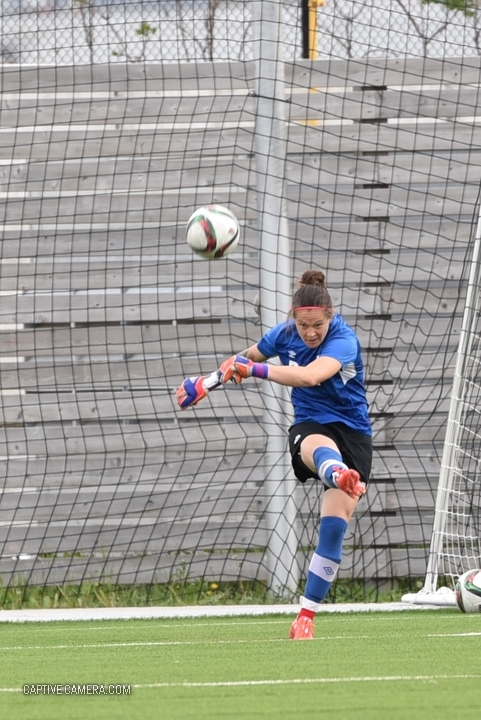 The strategy worked as Sophie Schmidt's wonder strike off a quick pass from Josee Belanger surprised English keeper Karen Bardsley as the ball flew into the top corner in the 23rd minute. 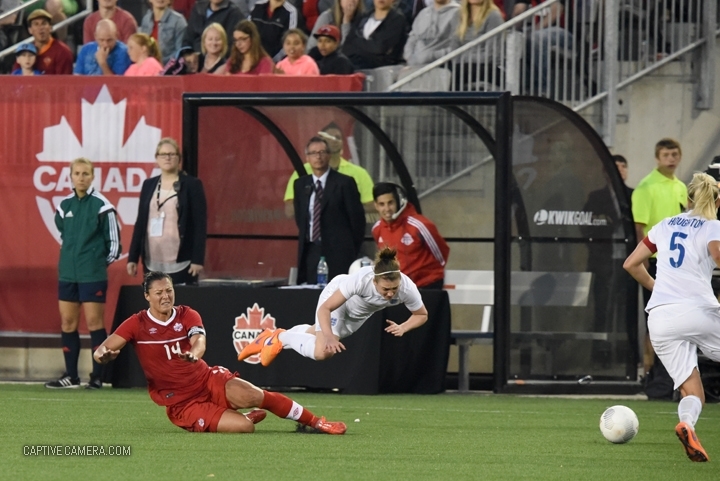 England attempted to even the score but Canada was too quick in their defense and counterattack, allowing only one opportunity in the 87th minute that rattled off the Canadian crossbar. 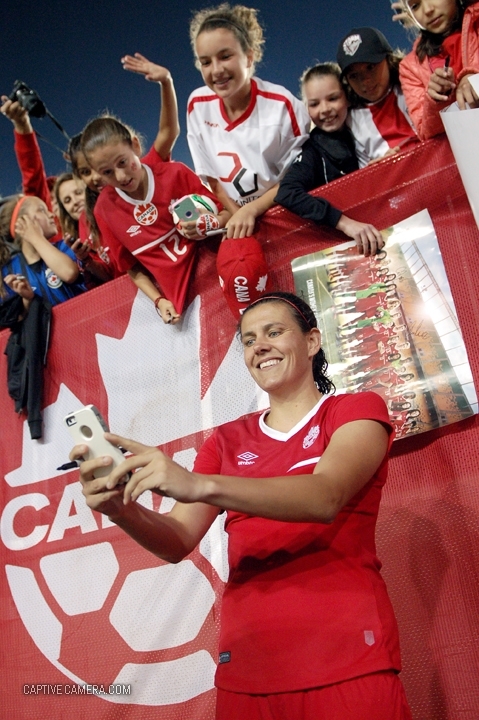 Canada next faces China in their first group game at the 2015 FIFA Women's World Cup Canada on June 6 in Edmonton, Alberta. 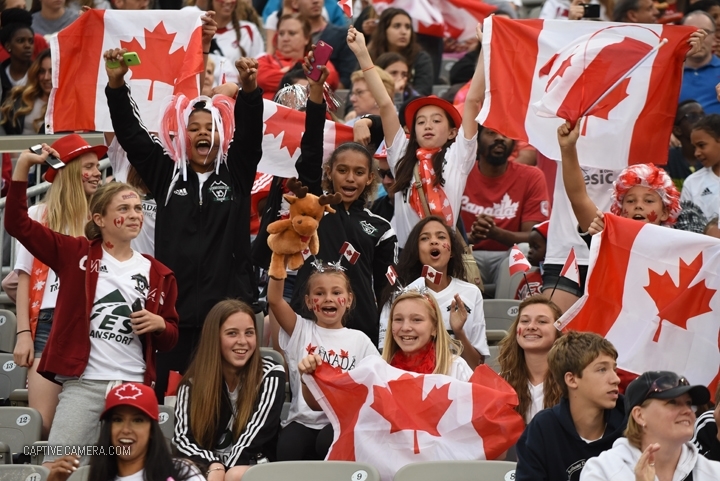 The World Cup tournament is being hosted by Canada in Vancouver, Edmonton, Winnipeg, Ottawa, Montreal and Moncton between June 6 and July 5. Tickets are still available for purchase. Originally published on Hispanos en Canada. 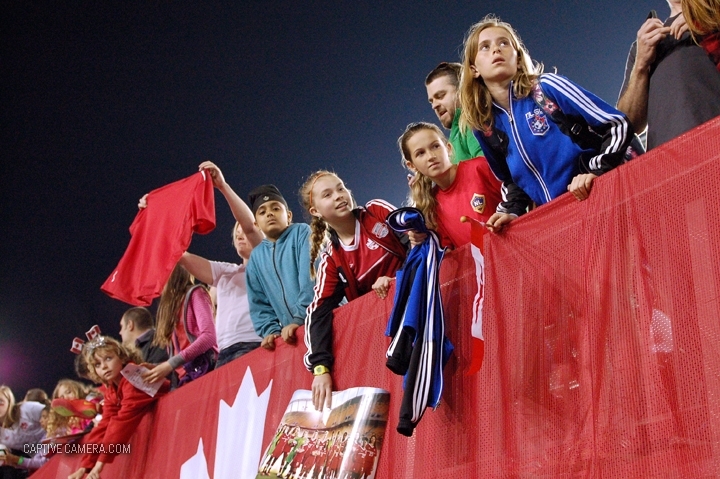 Over 61,000 fans were on hand to set a new Canadian soccer attendance record at the 2014-15 CONCACAF Champions League Final set in Olympic stadium, Montreal, Canada. 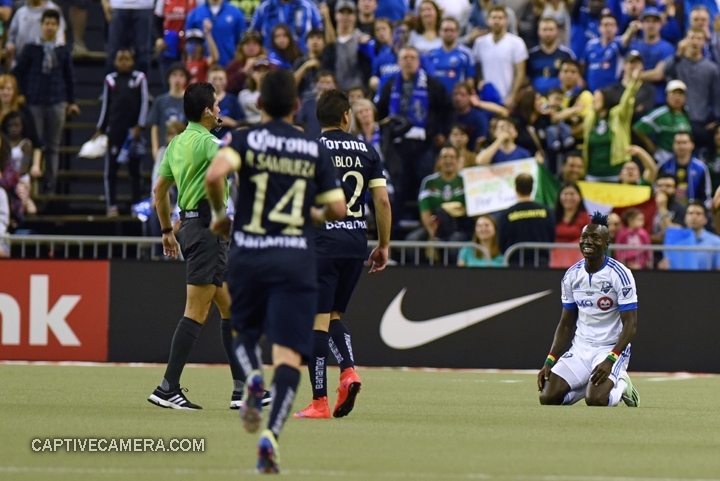 The final was to be disputed between Mexican Liga MX team Club America and Major League soccer team Montreal Impact. 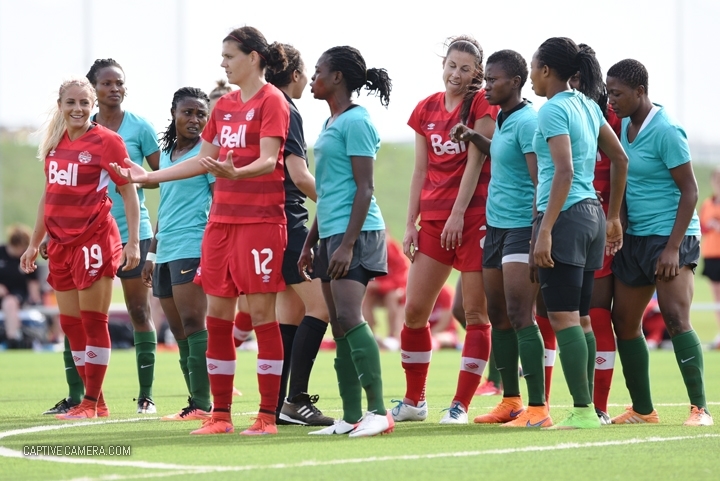 This marked the first time that a Canadian team advanced to the final of the CONCACAF Champions League. The CONCACAF Champions League is a regional tournament between professional soccer teams where the winner qualifies to participate at the FIFA Club World Cup. 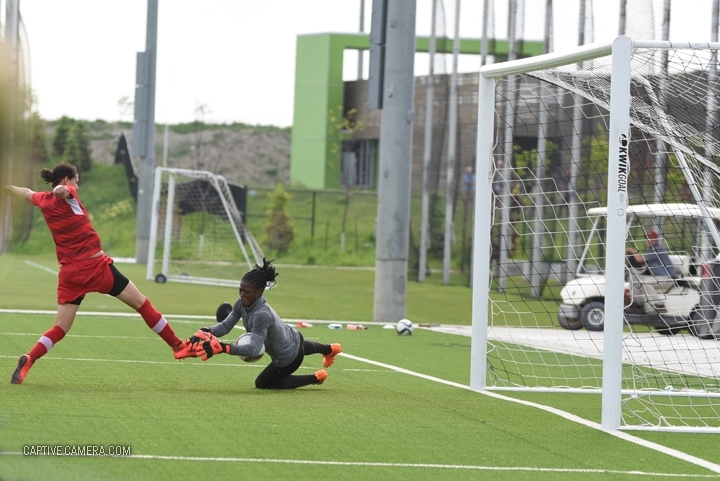 Montreal Impact enjoyed a successful tournament defeating a number of teams en route to the final including CF Pachuca of Mexico and Alajuelense of Costa Rica. Most remarkably, they held Club America to a 1-1 draw on the first leg of the final played at the Azteca stadium in Mexico City. Hopes were high for Montreal to become the first Canadian team to win the CONCACAF Champions League. Montreal Impact started on the right track by taking the lead in the 8th minute on a well worked assist from Ignacio Piatti to Andres Romero for the goal. 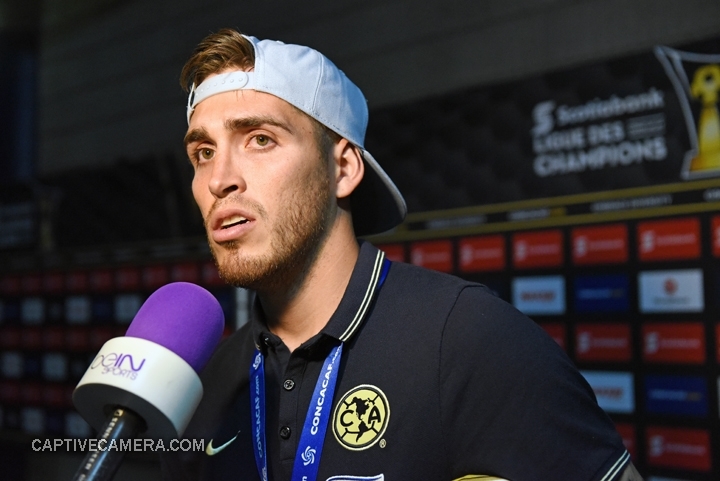 Apart from one close range miss by Dario Benedetto, Club America could not advance to position themselves for scoring chances. 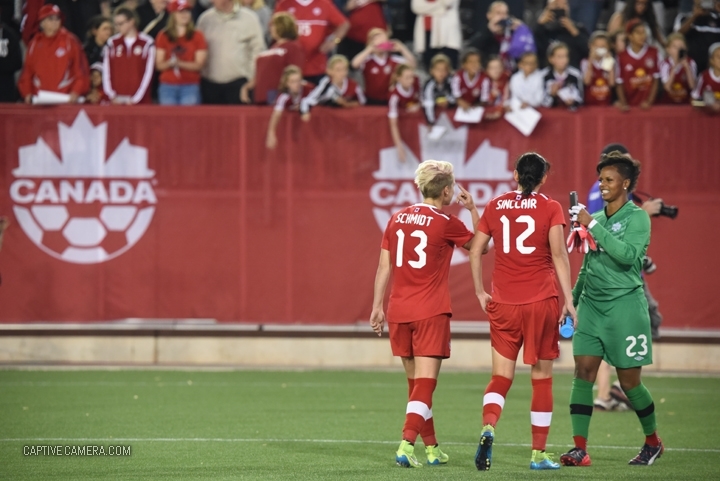 The first half ended with Montreal holding on 1-0. The second half became a different story where Club America came alive and stormed the defense in numbers to generate scoring opportunities. The tactic proved successful as the team scored 4 consecutive goals, among them a hat trick by Dario Benedetto and another by clutch player Oribe Peralta. 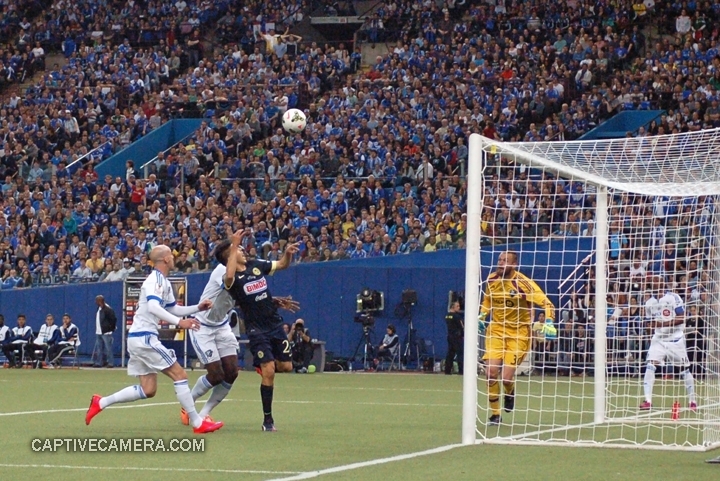 Montreal Impact scored late in the game to end the game with a 4-2 scoreline. Club America wins their sixth CONCACAF region title and will represent the CONCACAF region at the 2015 FIFA Club World Cup to be played in December at Japan. Montreal, Canada - April 29, 2015: Oribe Peralta #24 and Dario Benedetto #9 of Club America scored 7 goals each during the 2014-15 CONCACAF Champions League to share the golden boot award. 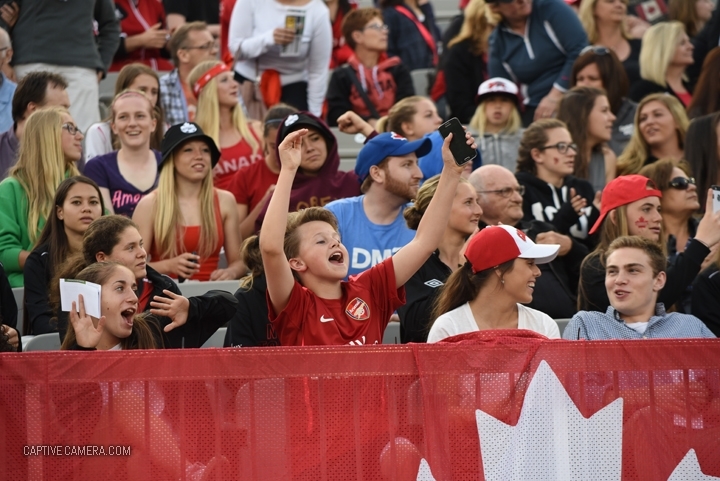 Montreal, Canada - April 29, 2015: Montreal supporters were on hand to witness the first ever CONCACAF Champions League final played in Canada. Montreal, Canada - April 29, 2015: Dominic Oduro of Montreal impact had a supporter section of his own. 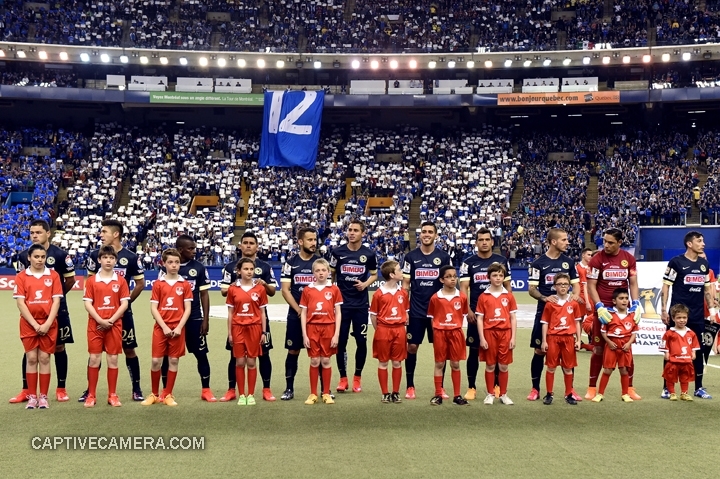 Montreal, Canada - April 29, 2015: Montreal Impact starting eleven. 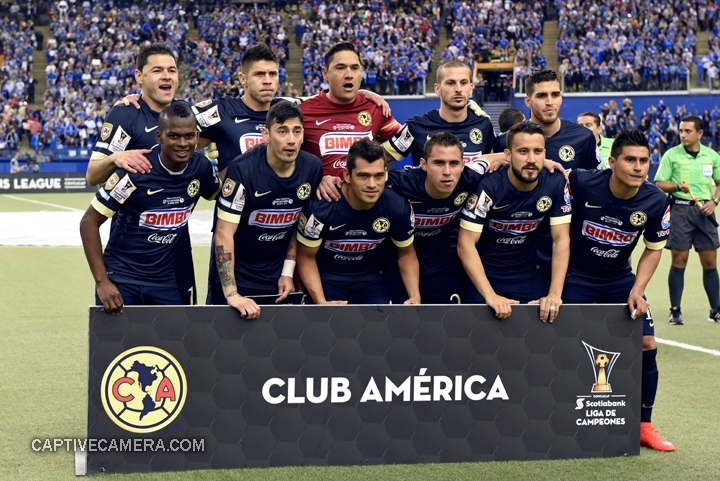 Montreal, Canada - April 29, 2015: Club America starting eleven amidst a sold out Olympic stadium. Montreal, Canada - April 29, 2015: Montreal Impact goalie Kristian Nicht shakes hands with Dario Benedetto who proved to be his nemesis. 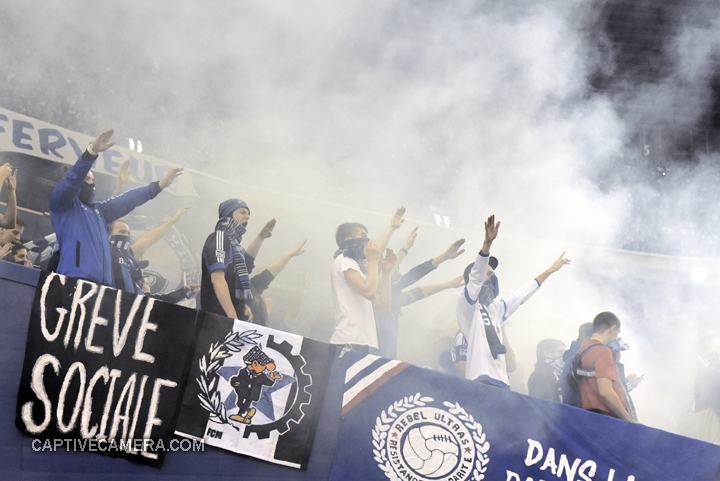 Montreal, Canada - April 29, 2015: CAPO for Montreal Impact supporter group Ultras Montreal. 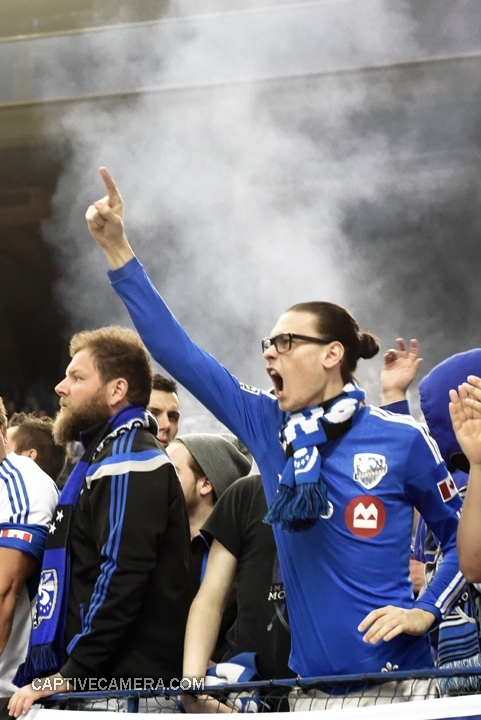 Montreal, Canada - April 29, 2015: There was no shortage of loud and passionate Montreal Impact supporters. Montreal, Canada - April 29, 2015: Smoke bombs marked the kickoff of the Champions league final match at Olympic stadium. 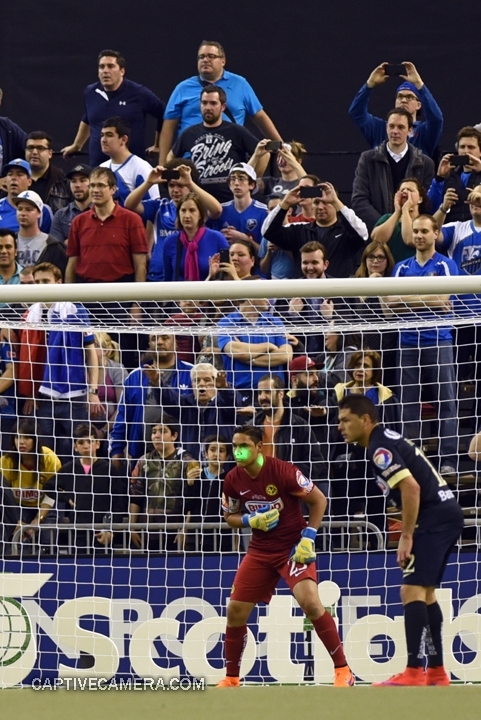 Montreal, Canada - April 29, 2015: Fans react after Andres Moreno scored for Montreal Impact in the 8th minute. Montreal, Canada - April 29, 2015: Montreal Impact players celebrate the early goal. Montreal, Canada - April 29, 2015: Montreal Impact coach Frank Klopas offers direction and encouragement to his players after their early lead. Montreal, Canada - April 29, 2015: Club America coach Gustavo Matosas shows signs of concern after giving up the first goal. Montreal, Canada - April 29, 2015: Andres Romero #15 of Montreal Impact chases down Miguel Samudio #6 of Club America. Montreal, Canada - April 29, 2015: Dario Benedetto #9 of Club America evades a tackle from Montreal Impact opposition. Montreal, Canada - April 29, 2015: Ignacio Piatti #10 of Montreal Impact nearly scores in the 24th minute only to be stopped by goalie Moises Munoz. Montreal, Canada - April 29, 2015: Ultras Montreal is a supporters group formed in 2002. 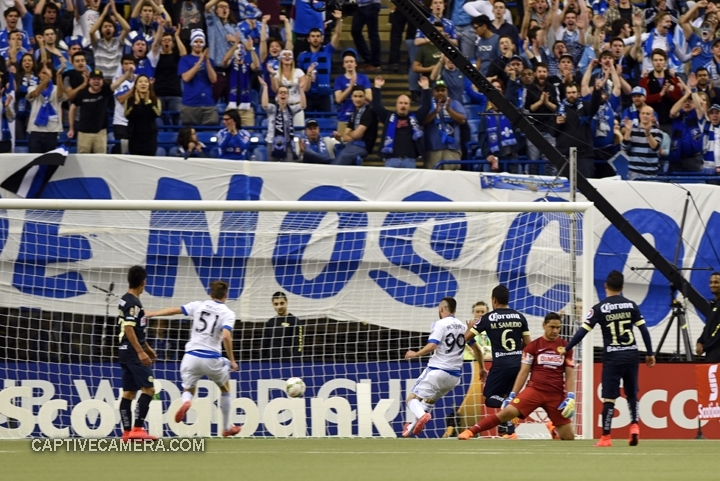 Montreal, Canada - April 29, 2015: Montreal Impact supporters remain hopeful with the goal advantage. Montreal, Canada - April 29, 2015: Laser pointers were used against Club America in response to lasers used on the April 22 game in Mexico City. 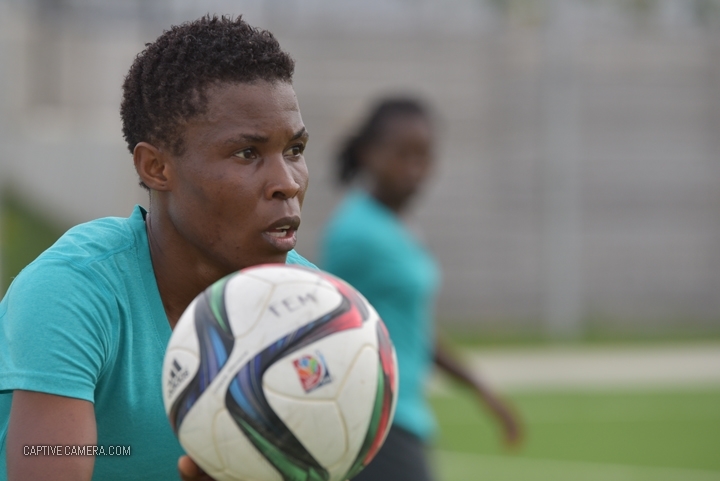 Montreal, Canada - April 29, 2015: Dominic Oduro appeals for a free kick after being fouled. Montreal, Canada - April 29, 2015: Nigel Reo-Coker #14 of Montreal Impact prepares to send the ball down the field. 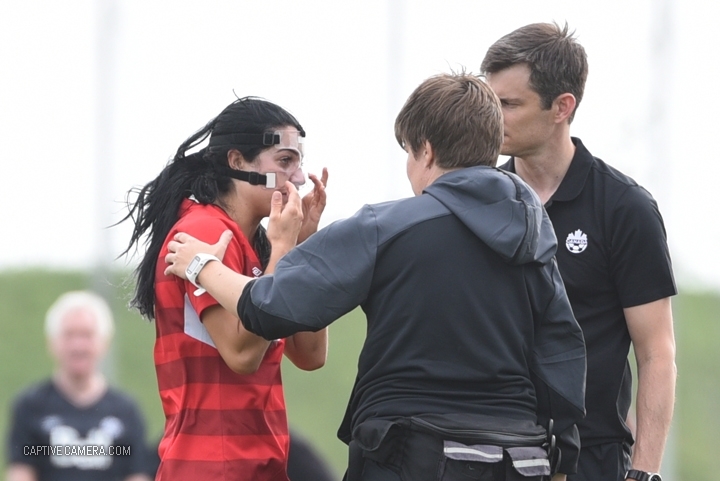 Montreal, Canada - April 29, 2015: Tensions were high as Montreal Impact maintained the 1-0 lead in the first half. 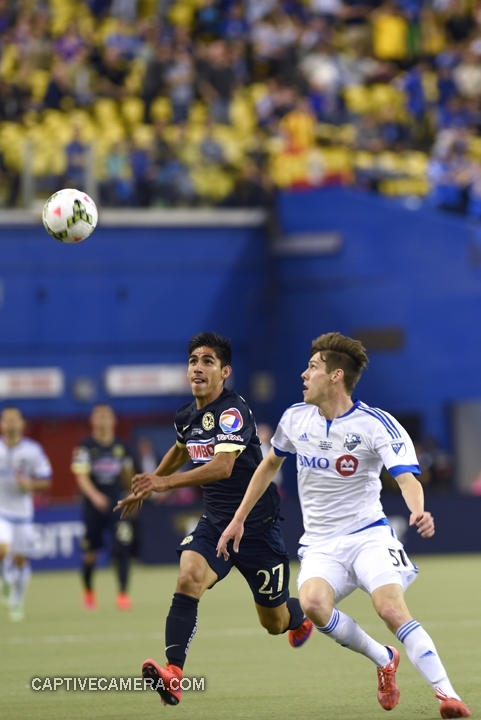 Montreal, Canada - April 29, 2015: Ignacio Piatti #10 of Montreal Impact is fouled by Jose Guerrero #21 of Club America. 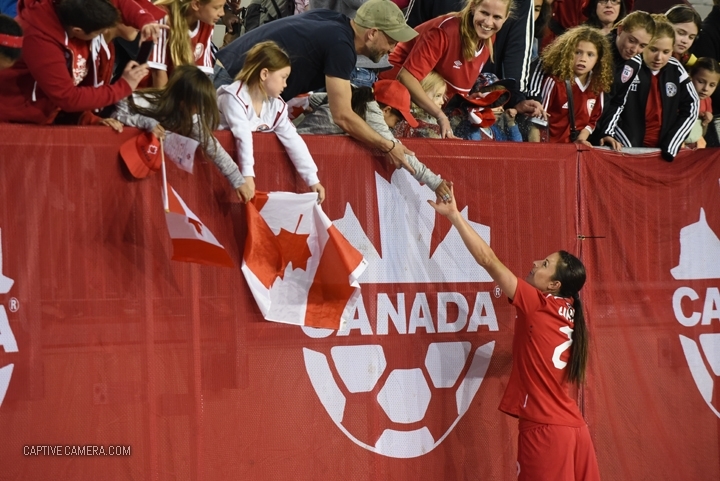 Montreal, Canada - April 29, 2015: A new record was set for soccer attendance in Canada by the 61000 fans at Olympic stadium. Montreal, Canada - April 29, 2015: Oribe Peralta #24 of Club America jumps to avoid Nigel Reo-Coker #14 of Montreal Impact. Montreal, Canada - April 29, 2015: Oribe Peralta #24 and Darwin Quintero #3 of Club America launch an offensive attack. Montreal, Canada - April 29, 2015: Dario Benedetto of Club America completes a mid air volley to tie the game 1-1 in the 5th minute of the second half. Montreal, Canada - April 29, 2015: Club America players celebrate the goal scored by Dario Benedetto in the 50th minute. Montreal, Canada - April 29, 2015: The local supporters continue to encourage Montreal Impact. Montreal, Canada - April 29, 2015: Oribe Peralta #24 of Club America heads the ball in to score in the 65th minute. Montreal, Canada - April 29, 2015: Club America teammates celebrate Oribe Peralta's goal to give a 2-1 lead over Montreal Impact. Montreal, Canada - April 29, 2015: A young diplomatic fan supports both Montreal Impact and Club America. Montreal, Canada - April 29, 2015: Club America players celebrate the second goal scored by Dario Benedetto #9. Montreal, Canada - April 29, 2015: Dario Benedetto #9 of Club America was very effective during the second half. Montreal, Canada - April 29, 2015: Darwin Quintero #3 of Club America prepares to take a corner kick. Montreal, Canada - April 29, 2015: The Olympic stadium was sold out to witness the second leg of the Scotiabank CONCACAF Champions League final. 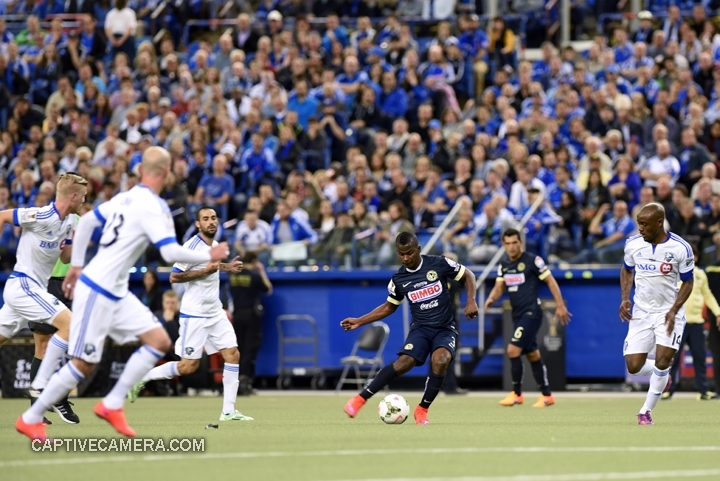 Montreal, Canada - April 29, 2015: Darwin Quintero #3 of Club America is surrounded by Montreal Impact defenders. Montreal, Canada - April 29, 2015: Oribe Peralta #24 of Club America attempts a shot on goal. Montreal, Canada - April 29, 2015: Dario Benedetto #9 of Club America scores his third goal of the game to seal a hat-trick. Montreal, Canada - April 29, 2015: Club America players celebrate Dario Benedetto's hat trick while Montreal Impact goalie Kristian Nicht is unsettled. Montreal, Canada - April 29, 2015: Dario Benedetto #9 of Club America is immediately surrounded by Montreal Impact players. 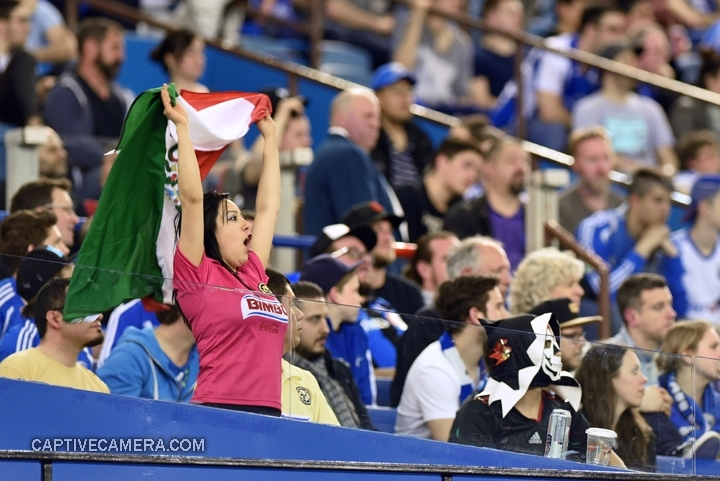 Montreal, Canada - April 29, 2015: A Club America supporter waves the Mexican flag. Montreal, Canada - April 29, 2015: Oribe Peralta #24 of Club America scores a goal that was ruled offside in the second half. Montreal, Canada - April 29, 2015: Jack McInerney #99 of Montreal Impact scores a late goal for Montreal in the 88th minute. Montreal, Canada - April 29, 2015: Jose Maduena #27 of Club America and Maxim Tissot #51 of Montreal Impact fight to win possession of the ball. Montreal, Canada - April 29, 2015: Club America players and staff celebrate the 4-2 victory after the final whistle. 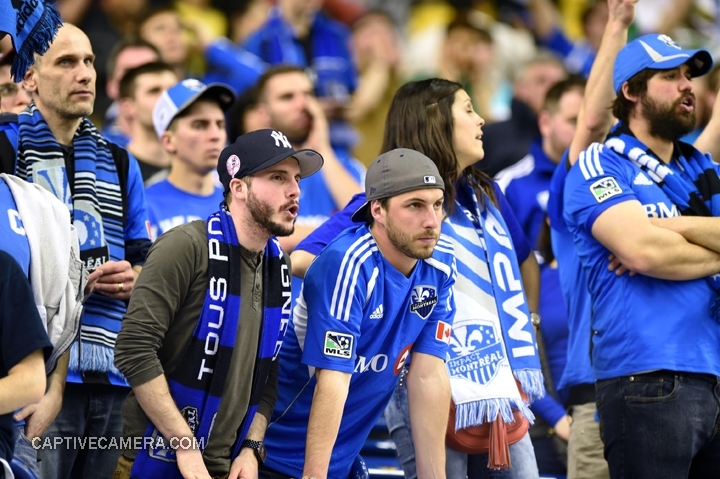 Montreal, Canada - April 29, 2015: Montreal impact fans look dejected after suffering the 4-2 defeat. Montreal, Canada - April 29, 2015: The golden boot is presented to both Oribe Peralta #24 and Dario Benedetto #9 of Club America. Montreal, Canada - April 29, 2015: Dario Benedetto #9 of Club America was awarded the Golden Ball after his remarkable 7 goal production within 3 games. Montreal, Canada - April 29, 2015: Club America players and staff receive their gold medals. Montreal, Canada - April 29, 2015: Club America claim their first Scotiabank CONCACAF Champions League trophy. Montreal, Canada - April 29, 2015: Club America fans celebrate their team's victory. Montreal, Canada - April 29, 2015: Dario Benedetto of Club America displays the tournament Golden Boot and Golden Ball. Montreal, Canada - April 29, 2015: Oribe Peralta , Dario Benedetto and Martin Zuniga of Club America display the Golden Boot, Golden Ball and Bright Future awards, respectively. Montreal, Canada - April 29, 2015: Club America players pose with medals and trophies at Montreal's Olympic stadium. Montreal, Canada - April 29, 2015: Michael Arroyo and Club America teammates carry the Scotiabank CONCACAF Champions League trophy. Montreal, Canada - April 29, 2015: Oribe Peralta of Club America at the media mix zone following the game at Olympic stadium. Montreal, Canada - April 29, 2015: Club America coach Gustavo Matosas offers a smile during the post game press conferenec at Olympic stadium, Montreal. 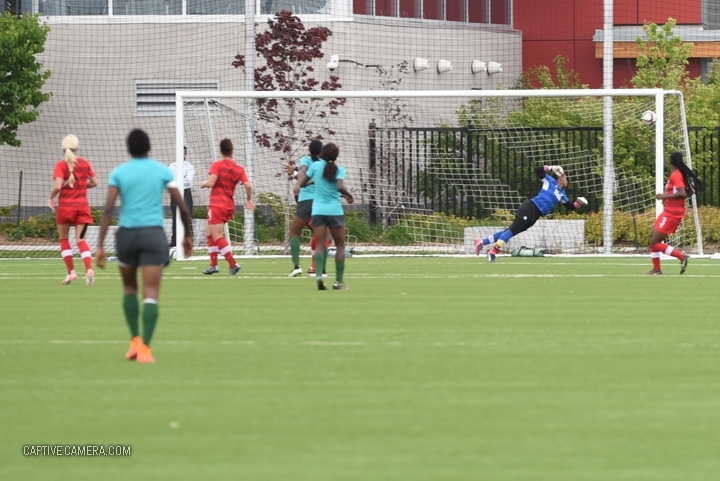 April 24, 2015 (Toronto) - A quick look at the official draw for 2015 Toronto Pan American games football groups where the men's Trinidad and Tobago team is drawn into group B position 3. 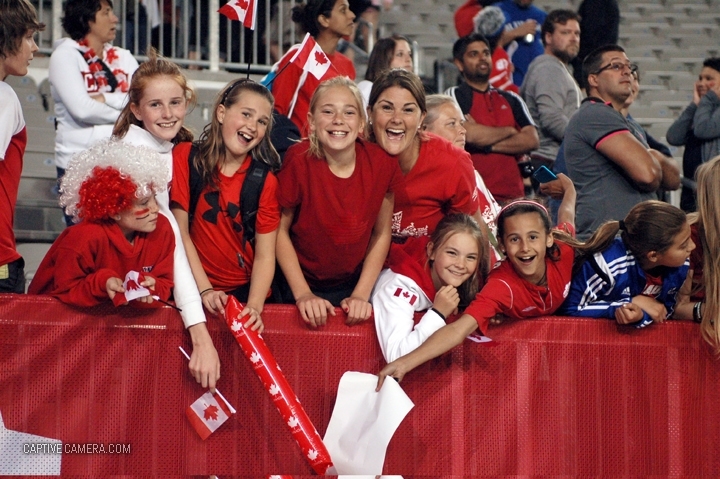 The 2015 Toronto Pan American Games will take place between July 10 - 26, 2015. 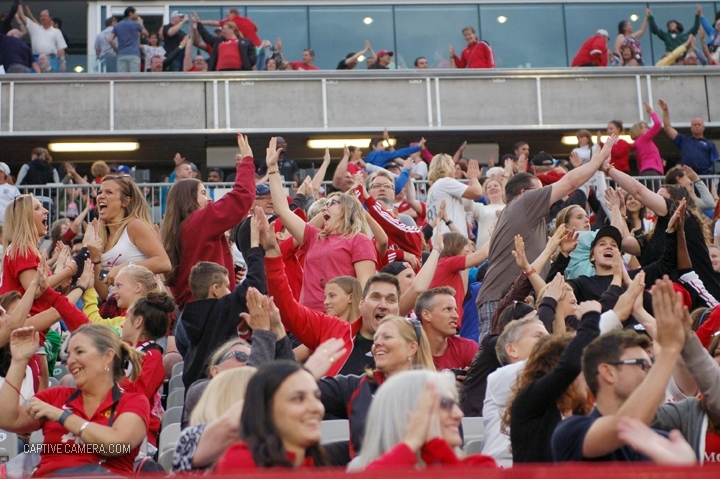 The football games will take place at Tim Horton's field in Hamilton, Ontario. The draw featured Amanda Martinez (singer), Dwayne De Rosario (Team Canada leading scorer), Helen Stroumbos (former Team Canada player) and Nigel Reed (TV commentator).